BEST WATERFRONT Deal in the Shuswap Today! 40ft RV at Glen Echo Resort, Sale includes 1/20th ownership of 85 RV site resort. Low annual FEES of $125/mo! Beach, Playground, Amenities, Metal Roof, Covered Deck, Summer Recreational Use on the LAKE! 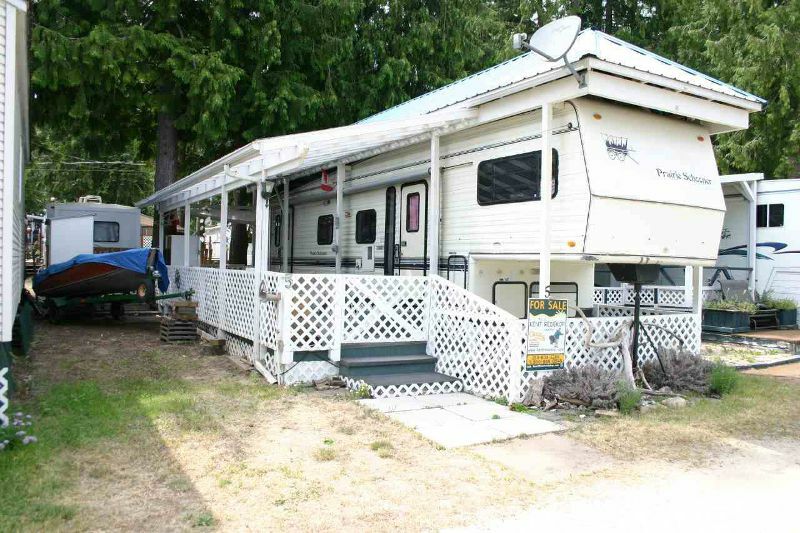 RV has 2 Bedrms, 3 Beds, Full Bathrm, All Hookups, Fridge, Stove, Washer, Dryer & Microwave, Shed. Enjoy the revenue of leasing out 61 RV Sites shared by the 20 owners, pad rents or taxes in most typical years! Place your boat buoy, enjoy the swimming area, sandy volleyball court, security gate, full on site manager, QUIET Park. Sale includes RV & $10,000 shareholders Loan credit, that is paid. Stop looking now..... this is the BEST Deal for Recreational Waterfront Today! Located just minutes West of Salmon Arm's downtown. You can also enjoy a boat ride to 3 local marina's including the Salmon Arm downtown wharf where you can take a stroll for ice cream or check out the lakeside patio at the Prestige Harbourfront Inn. You can't find a better location for boating the Shuswap! Watch Our Marketing Video: Click Here!